Ask for help, my KSMOS has encountered a lot of problems. First of all, I am a Chinese, English is not very good. I would like to ask if there is no modification of the game language MOD? Also, why can not my KSMOD be able to read the multiplayer game archive? and Why can not my KSFrenchScenario7 be used? 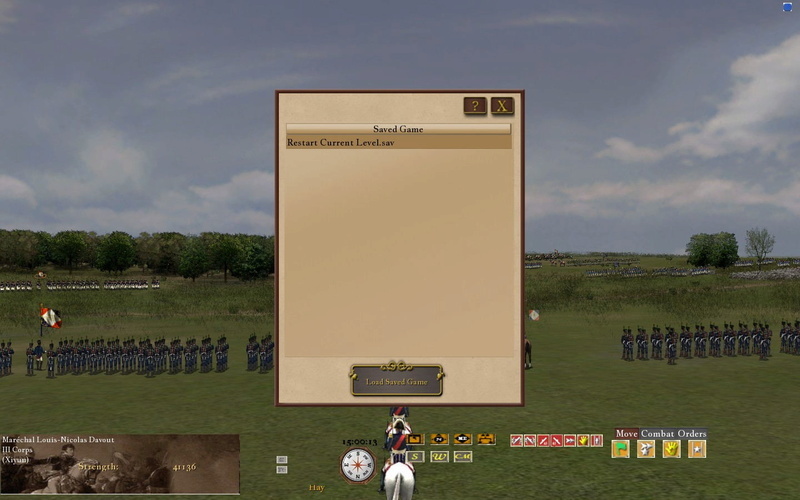 Not just KSFrenchScenario7, after all the French fights after it, I can not use, load these battles, will make the game crash. Re: Ask for help, my KSMOS has encountered a lot of problems. 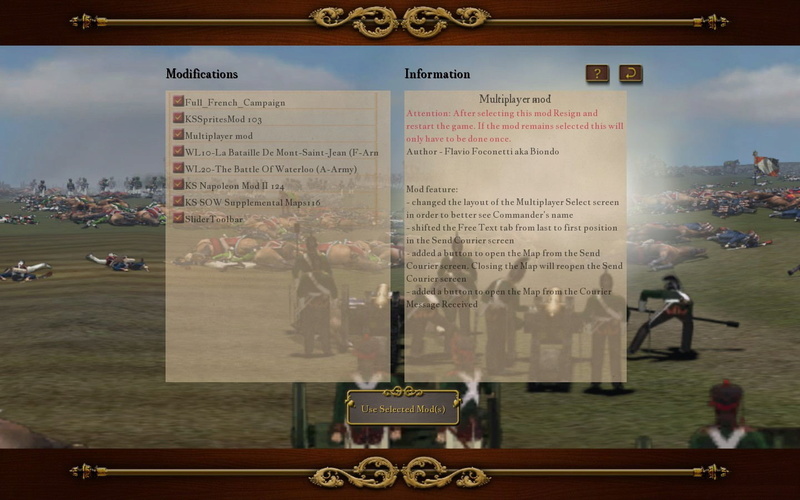 The mods created by other people may not work with the KS mod. If you want to use the KS mod, turn off all other mods. The KS French Scenario 7 requires that you have purchased the Pipe Creek expansion for SOWGB and moved the Pipe Creek lsl map file to SOWWL. 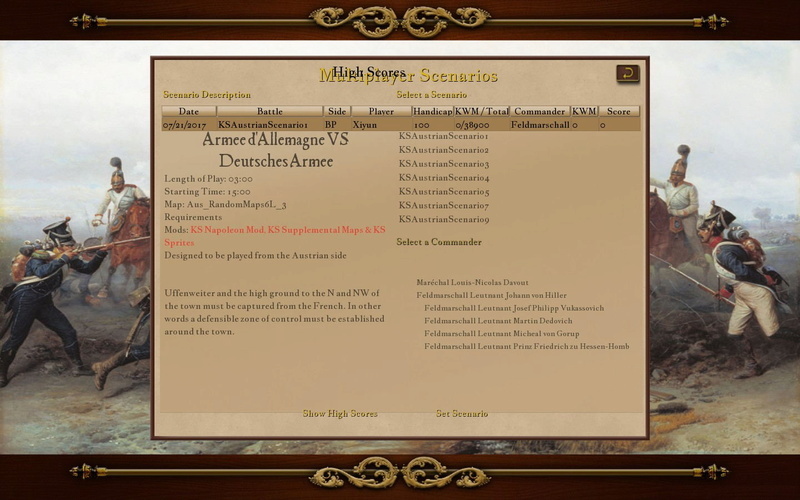 KS French Scenario 9 requires the maps from the Chancellorsville expansion for SOWGB. Pipe Creek expansion and SOWGB is what? Why can not I read online archives when I'm online? When i create a room and read online game archives. My game will be stuck. SOWGB = Scourge of War Gettyburg. 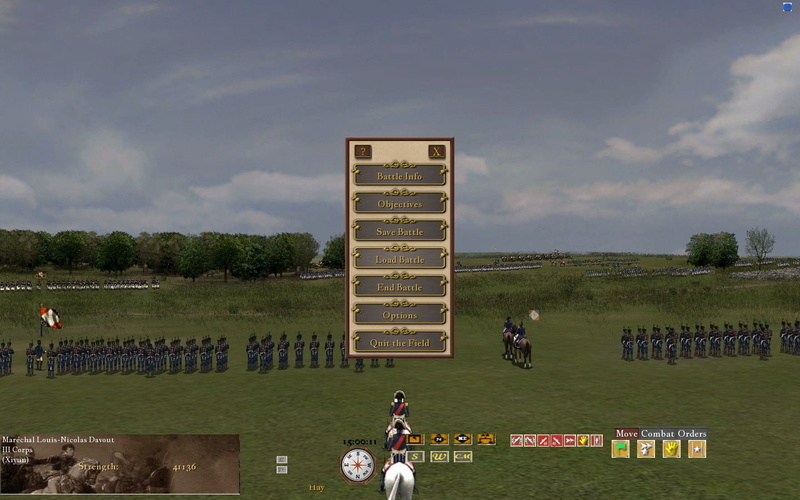 It is a game about the American Civil War. It is only sold by Matrix. It is not on Steam. I don't know. I've never pressed that button. Hi xiyunhong, welcome to the KS forum. Your English ios good, do not apologise for it, we can understand you fine. 1) Uncle Billy is correct - turn off ALL other mods apart from the 3 KS ones. 2) SoW: Gettysburg was the game NSD made before they made Waterloo. It covers a major battle of the American Civil War (1861-1865) which was about as important in that conflict as Waterloo was to the Napoleonic wars. All our group owns that game and we have copied across from it several maps and we fight Napoleonic battles on the American maps. If you do not own SoW:GB, do not worry about it, but try another KS scenario. 3) I tried to access the high scores as well and like you my game locked up. The high scores list is not very useful. I suggest not to access it. It could be a game bug - does it crash the game without the KS Mods enabled? 4) There is no language mod into Chinese. I am sorry. I think there are only about 3 European language versions - German, Italian, maybe French. OK, I think "Show High Scores" is an online game archive. I want to ask, if I play with others, when we need to do something else, can I save the file and wait until the next time I read the archive and continue playing with my friends? As viewing that archive seems to crash the game I suggest you view it when you are on your own - go into multiplayer alone, create a room, go into that staging room, select a user scenario then access the high scores. Take a screenshot (F4 key) and save it. Post the screenshot somewhere so your friends can see it. The file itself is called "MultiHighScore.dat" and you can find it in MyDocuments\SowWL. I am unable to read it using any text editor I have but you or your friends may be able to open it? Thank you very much,I do not care about ranking, I just thought it was read the file location, then, online games can archive? You can save a replay file of any game if that is what you mean. The two sides of each scenario set, such as the French scene, if I use the United Kingdom, will lead to what happened? Online game, I only need to read the archive, each player can read the archive with me? I'm using scene 1, but what happens when I read Archive of Scenario 2? and yes . I plans to edit the games user interface into Chinese.Because I want to tell the game more people, like this game players actually have a lot, but they are too hard because of the English and give up.But I do not know how to make modified language MOD, can you teach me? The scenarios are only meant to be played vs the AI and from the side named. They just won't work if played from the other side. Think of the concept as similar to the stock scenarios that come with the base game. "Online game, I only need to read the archive, each player can read the archive with me? I'm using scene 1, but what happens when I read Archive of Scenario 2?" My apologies, I don't understand your question. The KS Team also has a Replay Viewer and a Battle Statistics Generator we use to determine win/lose data and the performance of each commander. I recommend you download and use these rather than rely on the data the game provides, which is not very useful. Sorry, I do not know how to modify the GUI to use a different language. I don't even know if the game can handle non-Roman characters. We get corrupted characters in the GUI when we use simple things like accents or abbreviations in some European languages such as French and Spanish. For example, my friend and I play together Scene 1. You cannot restart an MP game from a save file. The procedure to stop and restart an MP game is complicated. I suggest you play the game from start to finish in one session. Its good that you have got MP games working though. Good job. Thank you for your explanation. I would like to ask questions. How did you modify the game UI? What tools? The program for modifying the UI is included in the SOWWL SDK. You can find a link to it on the NSD forum.